We know we need to sleep. We know our brains and bodies work better after sleep. But what we didn't know, until now, was why. Scientists have just reported the first major mechanical reason our brains need to sleep — certain cleaning mechanisms in the brain work better when we shut the brain down. Just like how dump trucks take to the city streets during the pre-dawn hours because there's less traffic, our brain's cleaners also work best when there's less going on. "This study shows that the brain has different functional states when asleep and when awake," study researcher Maiken Nedergaard, of the University of Rochester said in a statement. "In fact, the restorative nature of sleep appears to be the result of the active clearance of the by-products of neural activity that accumulate during wakefulness." We've known that our brains consolidate memories during sleep and perform other important functions. There are also benefits to the body during sleep — resting allows our muscles, bones, and organs to repair themselves. It also keeps our immune system healthy. We know that sleep has all of these benefits, but until now we didn't know any of the specific changes that bring about these sleep benefits. Charles Czeisler, a sleep researcher at Harvard Medical School in Boston, told Science Magazine's Emily Underwood that this is the "ﬁrst direct experimental evidence at the molecular level" for why we need to sleep. The paper was published in the journal Science on Oct. 17. All of our cells accumulate waste while they are working, and these waste products can be toxic. If they aren't removed they can build up and kill our cells. Throughout the rest of the body the lymphatic system washes these waste products away, but the brain is cut off from these actions because of the blood-brain barrier. J. Iliff and M. Nedergaard, STM, 2012The purple areas are the channels through which brain fluid flows, and the green areas are the glial cells that control the flow of fluid through them. The team just discovered the brain's unique trash disposal system last year — the find was published in the journal Science Translational Medicine on Aug. 15, 2012. It works like a plumbing system. The brain itself is bathed in a special clear liquid called cerebrospinal fluid, which doesn't mix with the blood and lymph system of the rest of the body. In the study from last year, they found that this fluid travels through special channels and washes the brain out. There are two types of cells in the brain — the neurons that send signals and the glial that keep them healthy. 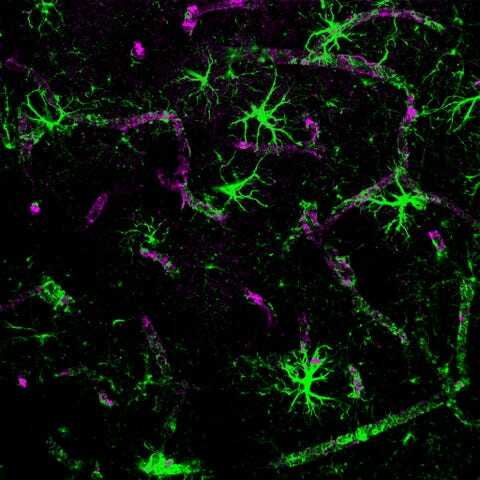 They found that these glial cells seem to create these cleaning channels around the neurons. It washes away toxic proteins and removes them from the brain's circulatory system. They are transferred to the general circulatory system, where the liver can remove them. Xie, et. 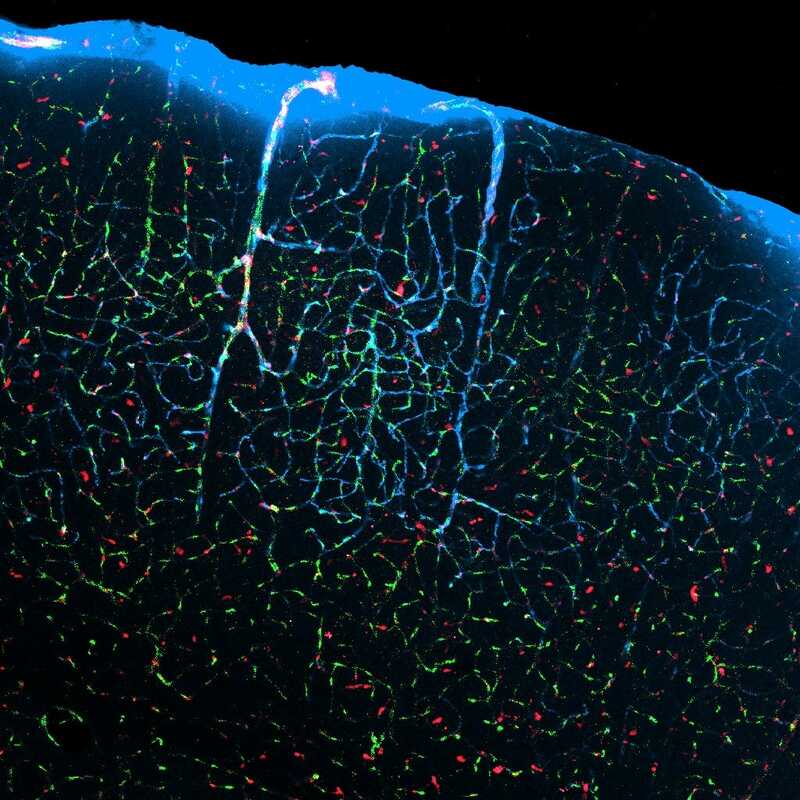 al, Science, 2013.When mice sleep, ﬂuid-filled channels (pale blue) between neurons expand and flush out waste. By studying this newfound pathway in mice trained to sleep on a microscope, the researchers found that this system was 10 times more active during sleep than it was while the mice were awake. They injected the mice with colored toxic proteins to see the system at work — when the mice were sleeping, these toxic proteins were removed from the brain twice as quickly as when they were awake. In the new study, they found that while the brain is sleeping, the neurons shrink by about 60% and the channels between these cells grow and fill with fluid. The glial cells then activate their pumping system to push the brain's cerebrospinal fluid through these extra spaces and flush out the area around the neurons. When we wake, these channels squeeze shut again as the cells plump up, and the cerebrospinal fluid is once again found mostly around the surface of the brain, not deep inside it. While awake, this washing process acts at only about 5% of its performance during sleep. All of this fluid movement is energy intensive, which is why the researchers think it can only happen effectively during sleep. Normally, all of our brain's energy is busy doing normal brain activities that support every thing we do — all of our movements, our thoughts, creating memories, and analyzing the signals that come in through our senses. By shutting these processes down, our brains are able to switch into cleaning mode. The toxins that this pathway removes are the kind responsible for neurodegenerative diseases like Alzheimer's. Understanding this pathway not only helps us understand our need for sleep, and possibly control it better with drugs that turn it on and off, but could also lead to new ways to treat and prevent these diseases. 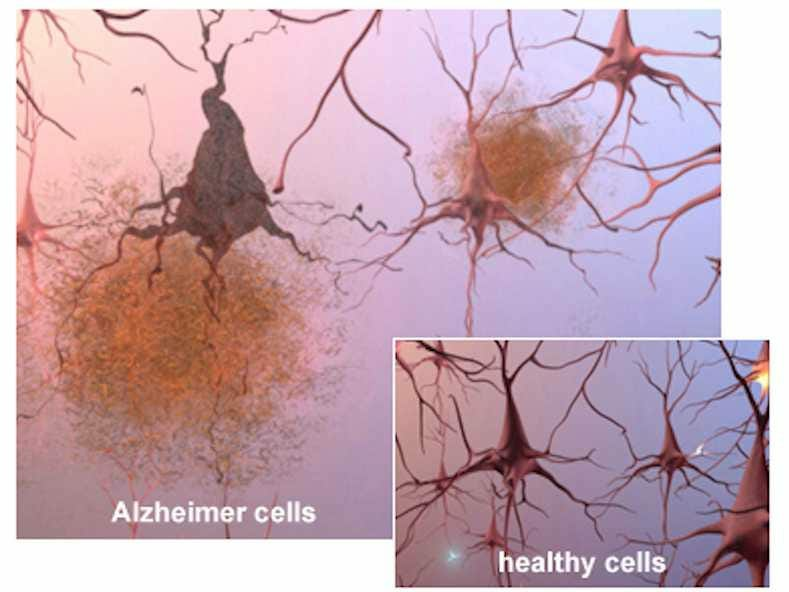 The buildup of toxic waste proteins causes brain cells to die in Alzheimer's disease. In a Perspectives article in Science Magazine about the study, Suzana Herculano-Houzel, a brain researcher at the Universidade Federal do Rio de Janeiro, even suggested that this build up of toxins is what turns on our need to sleep and makes us sleepy. The mice in the study were woken up after 60 minutes of sleep, so we don't yet know how the amount or kind of sleep humans get affects the washing process. While it sounds counter-intuitive, this could even explain why some small-brained animals need more sleep than large-brained animals. For example, bats sleep up to 20 hours a day, while elephants sleep four. Why? Because bigger brains have more space to store these toxins before they build up to dangerous levels and need to be flushed. Understanding how "brain structure and function changes in the two different states (sleep-wake) suggests that we can start to think about how we can manipulate the two states," Nedergaard told Business Insider in an email. Manipulations could include ways to put this cleaning system into "hyperdrive" so we could sleep less, but that's way in the future.